Real-time information became available on Metro trains on Thursday. Can we say hallelujah! Of course it’s been on stations for years, via Passenger Information Displays (known in the biz as PIDs) and the green buttons providing audio. But now departure data can be seen in the PTV app (and others) and PTV Next 5 web site; it shows as minutes to departure when real-time is available, otherwise it shows as the scheduled time. This completes the trilogy for metropolitan Melbourne: trams (via TramTracker, which is driven off decades-old tracking technology with some clever maths over the top), buses (implemented in the last couple of years) and trains. V/Line services aren’t using this yet, but apparently they’re working on it. PTV has released a new version of their API which includes this real-time information, and apparently some apps have already started integrating it. A few stations only have the scheduled times available, apparently due to not all the equipment being in place. 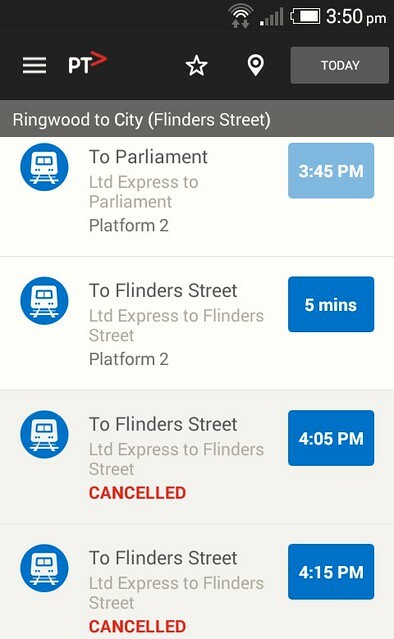 Some of those appear to be due to level crossing works; Flinders Street is the other one, because it’s a terminus station and I guess the algorithms can’t cope with the fact that train X arriving from Y should then go to Z, but sometimes gets transposed to a completely different destination. Sigh. So if I look at Frankston-bound trains from Flinders Street, it can only tell me times. And yet, if I look at Richmond for the same trains, it tells me the next trains to Frankston are in 3, 17, and 30 minutes. Hmmmm. Tram Tracker data is known not to be fully real-time; as I understand it, it’s done by interpolating (estimating) tram positions between fixed points. The train information seems to be linked to the signalling system, so is likely to be more accurate. Of course, the algorithms can only use the information available. Sudden delays or bypasses may not be factored in. Departure countdowns at stations or stops near the start of a run may not as reliable as those further along. This is not to say the information isn’t useful; one just needs to be wary of its limitations. The Android app currently has a bug that prevents you changing the station you’re looking at unless you go back to the Home page first. The iOS version seems okay in this regard. If you use the Ringwood line, on the common section for the Belgrave and Lilydale lines, it’s a little jarring that outbound trains are listed separately on the apps. Likewise other common routes like the Cranbourne/Pakenham lines. Check carefully; the top one listed may not be the first train you can catch. 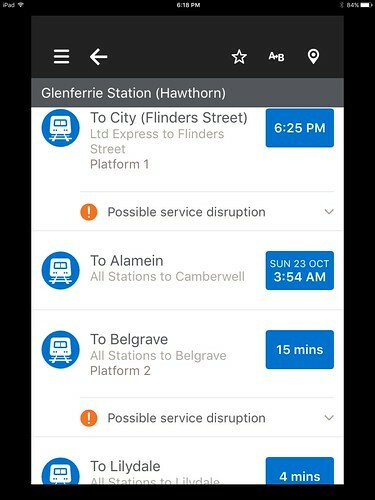 Also notable above is these train times for Glenferrie station showed the next Alamein train at 3:54am tomorrow (Sunday) morning! This isn’t even correct — even if you wait until then, you still have to go to Camberwell and change trains. Will it change how you catch trains? One dedicated tram user (yeah okay, it was PTUA President Tony Morton) commented to me that Tram Tracker had changed the way he catches trams, and I don’t think that’s uncommon. Many people who have access to the real-time departure information no longer bother to look up timetables. They just check the app and go. This of course is made easier on trams thanks to their mostly frequent (every 10ish minutes or better) services. Now that all three modes have this, buses and trains could go the same way, especially on the frequent lines, making it easier to use the network as a Turn Up And Go service — which is needed to make public transport more competitive with cars. On the infrequent lines, if there’s only one bus every half-hour, I think most are still more likely to check the timetable and/or Journey Planner. But the real-time updates will at least help you know if the service is on time. This sort of real-time information works brilliantly… provided you know which route(s) you need to catch. To reach its full potential, changes to the network to bring more consistent routes and stopping patterns and higher frequencies will help a lot… but that’s a subject for another post. In the meantime, getting real-time info onto trains is a big plus. ← Previous Previous post: How accessible is Vicroads HQ for non-car users? Next → Next post: How many people are affected by rail shutdowns? Live bus arrivals seem very inaccurate to me, to the point where I actually doubt whether they are live. This is for the 216/219/220. Live tram arrival times at many stops, with Tram Tracker, Tram Hunter or PTV are wrong, but they are consistently wrong and if you are a regular user, you get used to that. An outbound tram arriving at Domain Road will probably arrive in three minutes, although the PID and apps will say one minute. If my journey is time critical or at night, I check with apps. If it is not, turn up and hopefully go. It always seems odd to me that other countries can run their public transport on time or be frequent enough for it to not matter, but Australia cannot. 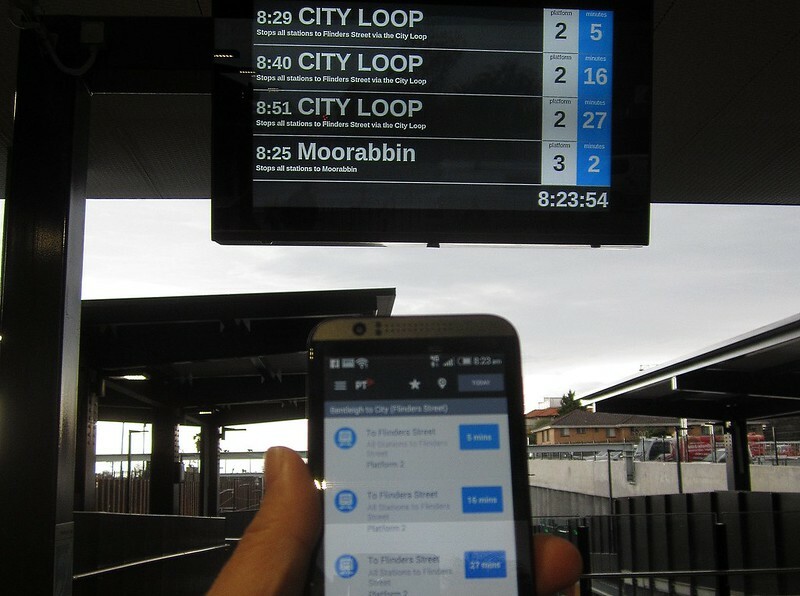 We can’t expect much from train apps when there is no way to find out if a train is going to go Flinders St then around the City Loop or elsewhere using platform information at inner stations. Whinges aside, live train information is good. If you know the late packed train that is arriving has another train two minutes behind, some might just wait for the second train. One of the biggest benefits (at night when services are sparse, especially) is that a delayed service can be a good thing if you can know about it without having to rush to the station and hoping for the best, or worse assuming you’ve missed the service only to see it leave in front of you. Of course, the opposite can also occur where a service is so delayed that it runs minutes before the next scheduled service, with the following service probably being delayed too – now you can know in advance when you have to rush as well. Will the audio coming out of the speakers in the train now be correct? I have been in the train a few times when the audio said “the train is going to Werribee” when it was actually going to Craigieburn! It seems to work somewhat but there are still quirks. I was at Flinders Street last night and thought I’ve missed my train. However, the app showed a washed out box with the scheduled time (in the past), with a different platform from the usual one (8 instead of 4). Thinking I had missed a train, I assumed the “washed out” state means that the train is gone and that the app hasn’t updated the availability of the train. I was about the give up and go upstairs to the main area to quickly grab a takeaway when I heard an announcement that the train is delayed and will be arriving at platform 8. So I dashed to platform 8. A second look at the app shows that this train is no longer on the schedule. A quick look at the platform arrival screen shows another line (Sandringham), but on closer inspection, I saw that my expected (but delayed) train is the next one after that. The app no longer says anything about this delayed train but then I heard a second announcement saying that the Sandringham train is delayed, while my train will be arriving on platform 8 or 9. Platform screen now shows my train. Moments later, it switched back to the Sandringham train, while the screen on platform 9 shows my train (previously showing “Not taking passengers”). An announcement soon followed confirming this. My train finally arrived, delayed by 20 minutes, though I wasn’t complaining as I would have missed it if it wasn’t delayed. The next one wasn’t suppose to be there for another 10 minutes. However, I can understand that someone who arrived just on time or slightly late would have got confused by the sort of chaos and probably end up waiting for the next one (as I almost did). Also I don’t believe the app would have coped with this sort of uncertainty and would have been timed out the train and would show the next one. Is real-time information supposed to be available for all metro bus routes? It never seems to be working for route 402, although other Sita routes have it. It’s pretty annoying to have to fish around for different routes when you’re travelling on common sections. I’m not sure of the best solution, but some obvious ones are to show “parallel” routes immediately under, or otherwise in a lighter shade interspersed with the ‘main’ line. It’s common across the network – even on the Belgrave/Lilydale line example you gave there’s the Glen Waverley common section too, and if you’re going around the loop that’s up to 7 stations from Flinders. I think it’d show that we could do a lot better at spacing those services so common sections get even headways, rather than what often feels like uncoordinated timing! I use the realtime bus info all the time as the bus stop is right outside my house. Rather than wait outside, I usually check the app and stay inside until the bus is a few mins away (if it was more consistently on time the just leaving a few mins before the scheduled time would be ok). Only issue I have is that often the estimate is not accurate which is fair given how variable roads are but for instance yesterday the app said the bus was 8 mins away (and delayed..). I left 4 mins after that with plenty of time and had to run the bus down as the driver had managed to make up some of his delay. I wonder if this information will carry over to third party apps like Train Trapper and Google Maps. If the real time information is indeed correct then we can choose the app that suits us best.